Complexity is mentioned in professional discussions from astrophysics to zoology. There is a sense that previous generations led a simpler existence and did not have to deal with it. Understanding whether this is true or not can help to put into perspective present day efforts to handle complexity. The other approach is to consider a small number of alternatives, whatever comes to mind (Options A, B, C and D), and assess their impacts on a limited set of objectives, perhaps an operating cost reduction or an improved level of safety, weighing the options using previous experience in the field, relying on the fact that the proposed options represent small incremental changes from the current state so our experience is a reliable guide. The first approach he calls the Rational Comprehensive or Root approach and the second the Successive Limited Comparisons or Branch approach. Lindblom goes on to describe how the second approach operates in practice (Figure 1). The fact that the systems being addressed are in a constant state of flux. Twenty years later, in Still muddling, not yet through2, Lindblom discussed some refinements of his ideas but concluded that his original observations still hold. Even today, we see that complexity is used as an excuse for unwanted surprises and as a rationale for using techniques based on order and stability in situations where neither exists. Complexity clearly is nothing new. A valuable and comprehensive advance in the understanding of complex systems was encapsulated in the development of the Cynefin framework3, illustrated in Figure 2, and the insights and methods that flow from it, see for instance The Cynefin Mini-Book4. Some treatments of complexity are based on inanimate systems, such as assemblies of software modules, or on the behaviour of groups of animals and insects, such as flocks of birds. 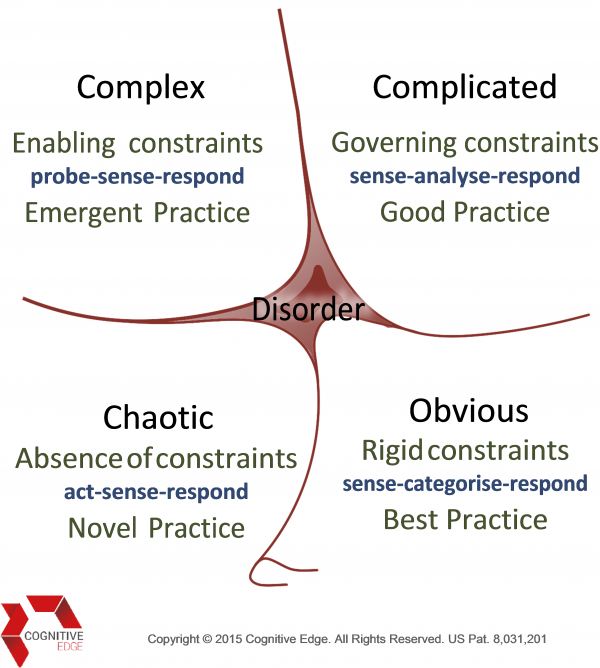 While it has wider application, the treatment of complexity in the Cynefin framework is at its most useful when dealing with systems in which human beings are the dominant force. Among other things, the Cynefin framework resolves one major problem that limited Lindblom and presumably others working in this field during the middle of the twentieth century. It allows us to understand complexity in relation to other sorts of systems that we encounter, those represented by the other domains in the framework. Complexity is no longer a nebulous influence indiscriminately making life difficult. It can be understood. We can tell whether it is present or not in all or part of our work and adopt methods to suit. The framework also meets the need that Lindblom identified for something more than muddling through. Snowden and his colleagues have developed methods5 for working in the Complex domain that complement the well-established systems analytic methods that are at home in the Obvious and Complicated domains, the domains where ordered cause-effect relationships exist. Rather than fight context dependence, deep entanglement with stakeholders and the absence of stable cause-effect relationships, these methods take the features of a complex system as their starting point. Complex systems methods rely on light touch framing and facilitation. They tap into the experience and observations of the people within a system to allow them to explore it and their place within it. Insights into the current state, disposition and possible future direction of a system emerge from the only thing we can really rely on, the system itself in the form of the people within it. Only a limited understanding of these methods can be gained by simply reading about them. To appreciate their value, it is necessary to experience them. 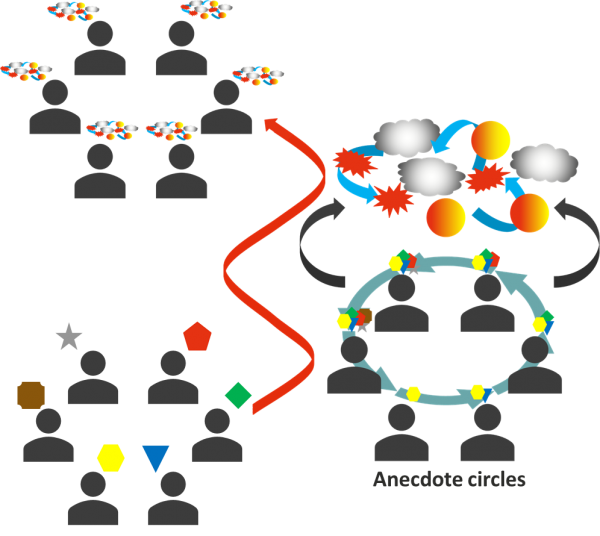 Nevertheless, to offer some indication of what they entail, one of the simplest techniques, the Anecdote Circles method6, is outlined here with reference to Figure 3, which represents people entering into the process with more or less distinct views of their current situation and leaving with an enriched understanding that they share as it has emerged from their interaction. The outcome is more than the simple sum of the inputs brought to it by the participants. Fresh insights and concepts develop during the exercise, insights that would not be gained by simply combining the separate views of those who take part. Loosely framed by a topic and stimulated by unbiased prompts, the method exploits the human propensity to recall and exchange experiences as narratives. Narratives are not to be confused with stories. They might be as brief as a single sentence describing something that occurred to or was observed by the contributor. The facilitator of an anecdote circle intervenes only as much as is required to ensure participants remain receptive to emergent insights. Among other things, the facilitator must: avoid groups drifting into an exchange of opinions; prevent one member of a group taking over the process; disrupt any attempt by participants who are uncomfortable with the open nature of the exercise to introduce a structured form of interaction; invigorate the flow of contributions if it starts to flag, and; avoid influencing the participants. The participants’ contributions might be recorded to be used as a resource for further work. In a more extensive method, key features of contributions can be used to develop a representation of the factors at work and how they interact, all emerging from the experiences and insights of the participants alone. This method has the capacity to bring to the surface information and insights that a questionnaire or structured one-on-one interview would never expose. Participants develop their thoughts in response to their own experiences and to the contributions of other participants. Their input is not steered by a facilitator’s hints or guidelines. It is not channelled by a predefined framework as happens in SWOT analysis or when brainstorming solutions to a problem, for instance. The difference goes well beyond using open questions, ensuring everyone has a chance to contribute and respecting all their inputs. SWOT, brainstorming and related methods have their place but that place is not in exploring complex systems. In each case, the desired end is pursued in a way that avoids conditioning or limiting the outcome with an external frame of reference or a preconceived sense of priorities. The SenseMaker™ method is especially powerful and has a wide range of applications. It offers a means to tap into a large number of people in a complex setting using web-based tools. This allows the engagement of geographically distributed groups over extended periods of time on a large scale and, thanks to the internet, at moderate expense. Complexity need no longer be seen as a necessary evil that limits what we can do. It is a fact of life that we can allow for in the way we work, without compromising the quality or integrity of our efforts. 1. Lindblom, C. 1959. The Science of "Muddling Through". Public Administration Review 19 (1): 79-88. 2. Lindblom, C. 1979. Still muddling, not through yet. Public Administration Review 39: 517-526. 3. Snowden, David J.; Boone, Mary E. (November 2007). "A Leader's Framework for Decision Making". 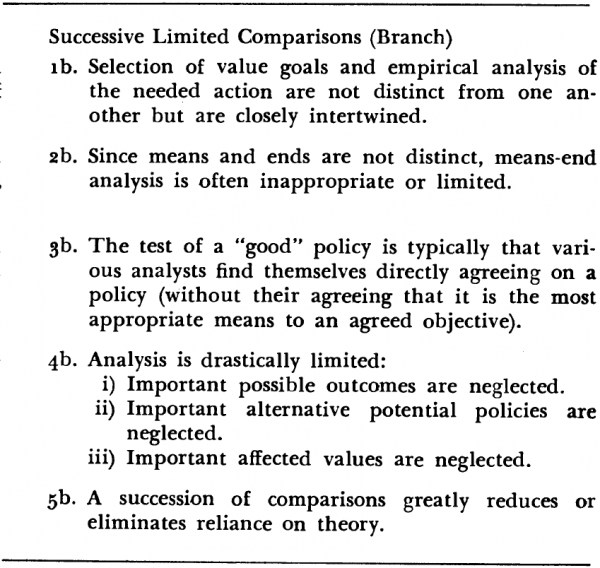 Harvard Business Review, 69–76.